Yardstick Studio, LLC was recognized for three ArCHdes Awards this year! ArCH or Architects Creating Homes, is an organization of Licensed Architects, from around the world, that practice residential architecture. 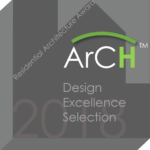 ArCH’s mission is to nurture the success of residential architects and architecture, the encouragement of excellence within the profession, and the promotion of the value of Residential Architects for clients, homeowners, neighborhoods, and communities. For more information, check out the ArCH website. That’s the way to do it, Rod. Congrats on your awards: you earned them. Thank you Rand! I really appreciate it!